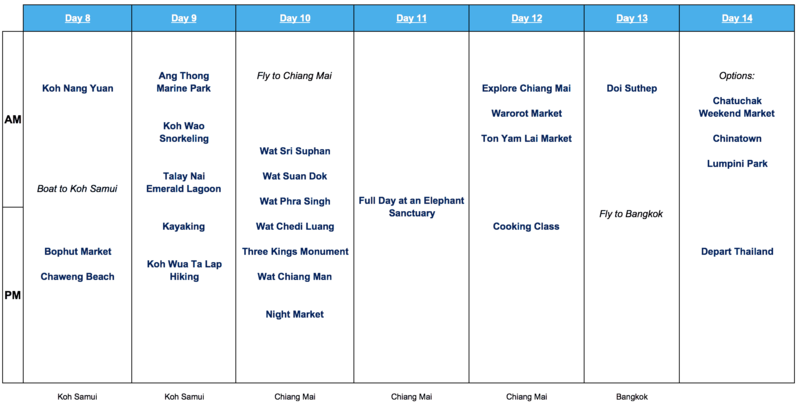 Welcome to the Two Weeks in Thailand Itinerary! Two weeks in Thailand is the perfect amount of time to explore all around the country. From the capital of Bangkok to the beautiful beaches of Koh Samui, Phangan and Tao to the northern jungles of Chiang Mai – this itinerary will go over it all. I also put together a second two week itinerary that includes some of the western islands as well if you want to check that out too. Please note – this itinerary plans its timeline around the full moon (or half moon) party on Koh Phangan on the night of day 4. You can easily move around the itinerary as you see fit if you are planning on heading to the party on a different night of the trip. If the full moon party is not something that you would like to add to the itinerary – no worries at all – you can still head to Koh Phangan and enjoy all that it has to offer. ​Before diving into the itinerary be sure to check out the Helpful Tips section to get you prepared for your trip. Take a look at the map below which shows you where each city that is part of this itinerary is located throughout the country. You will start the journey in the center of the country in Bangkok before heading to the islands down south, flying up north to Chiang Mai and finishing back in Bangkok. ​Now lets get on to the actual trip! The following is a detailed breakout of the daily attractions and activities on this two weeks in Thailand itinerary. Feel free to scroll through and click on any more in depth posts along the way. There are so many different areas and hotels to choose from when deciding where to stay in the city. Here is a list of some top rated ones. To check out more feel free to browse through Booking.com for the best deals. On your second day in Bangkok, it is time to head outside the city and to ancient capital city of Thailand – Ayutthaya. Here you will find some of the most incredible temples and architecture in Thailand. It makes for a perfect day trip and is a great way to explore another part of the country during your time there. Feel free to check out the Ayutthaya Day Trip Guide that will walk you through the entire day for beginning to end. After making your way around Ayutthaya for the day, head back to your hotel in Bangkok, where you can relax and get some much needed massages. It is now time to make your way to the islands of Thailand, where you will get to relax, hit some beaches, do some hiking and enjoy the one and only Full Moon Party. To get to Koh Phangan, you first have to fly to the island of Koh Samui. There will be a few flights in the morning from Bangkok to Samui that should work out well here. Once you get to Samui, you will then make your way to one of the ferry terminals for the 30-40 minute boat to Phangan. You can check out the ferry website which you can look at times and book your tickets. The tickets will either be through Lomprayah or Seatran. If you have some time between landing and your boat, you should definitely stop by the giant gold Big Buddha (very close by to the Seatran terminal). Once you arrive in Phangan there should be plenty of songthaews (pickup trucks with seating in the back) that can take you to your hotel. You can then spend the rest of your afternoon (probably somewhere in the 2-3PM range) relaxing by the pool and beach, enjoying the Thai island life. In Koh Phangan you can choose from a variety of accommodation options. Some are right near the party scene while others are farther out to get away from the craziness. ​During your one full day in Koh Phangan you can choose from a variety of options. Many hotels/hostels will have an arranged tour of the island that will take you to a variety of different beaches where you can snorkel and to waterfalls where you can take a dip. It is a great way to see the whole island and what it offers. Another option here is to just relax, hit the beach, maybe snorkel a bit and take it easy before a long night out. A third option if you are a bit more adventurous is to hike to the highest peak of the island – Khao Ra. If you decide to do the hike, it will be quite the experience hiking through the jungle and seeing the island from above. To get to the Khao Ra starting point, first make your way to “Khao Raa Bungalows”, which you can search on google maps. If it does not come up then look up “Safari Boat Valley” and the bungalows are just a couple minutes north of it. From the bungalows there are clearly marked signs up Khao Ra, first on a wide dirt path and then through the jungle. After about one and a half to two hours of hiking you will reach the top of the mountain. Take in the views looking both north and south, and just enjoy being on top of Koh Phangan. You can then make your way down the path and back to your starting point which will be way easier than the hike up. If you took a cab here then just make sure to tell them what time to pick you back up or get their number so you can call them when you are almost back at the bottom. After a morning/early afternoon of hiking, grab a nice big lunch and start hydrating very well for what is sure to be one if the crazier parties of your life. Once the sun begins to set on the island, the full moon party festivities are just beginning. Check out our Ultimate Guide to the Full Party for everything you need to know about this epic night. If your trip does not match up with full moon or if you are not interested in doing so, it does not change much on the itinerary. Simply just act if this was another night out in Thailand. ​Due to the fact that bedtime for you was probably in the 6-8AM range, day 5 is going to be a full on rest and recovery day. After waking up in the afternoon, grab some lunch and relax by the beach for the next couple of hours and maybe get a nice massage after running around the previous night. You will then hop on an hour boat ride from Koh Phangan to Koh Tao (there is a 5:30PM boat through Lomprayah that will get you there but be sure to double check the schedule beforehand). After getting to your hotel, feel free to walk around the streets of the Sairee Beach area and grab some dinner before resting up for a big day 6. On day 6 enjoy a day of scuba diving around Koh Tao. Check out our One Day Try Dive Experience for a detailed guide to the day. Your day will end later in the afternoon, when you can hang out by the beach, pool or bar to end your 6th day in Thailand. If you want to enjoy the nightlife of Koh Tao there is plenty to take part of. The beach bars that line Sairee Beach are great for sunset drinks and fire shows later on. There is also a well known pub crawl that takes place 4 nights a week. Whatever you decide you really cannot go wrong here. Koh Tao is full of viewpoints and isolated beaches. To get to these you will have to work for it though as you hike your way there. A great hike that combines all that Koh Tao has to offer is the hike from Mae Haad to Chalok Baan Kao Bay. You can head on over to the Hiking in Koh Tao overview page to read all about this awesome experience. ​This morning you will head over to one of the most pictured viewpoints in all of Thailand – on top of Koh Nang Yuan. The area is actually three separate island that are attached by sandbars going from one island to the next. ​A quick 20-30 minute longtail boat ride from Sairee beach gets you to the dock of Nang Yuan. Be sure to let your boat driver know how long you would like to stay there as they can come pick you up when you are finished up. Since it is a privately owned island, you must pay a small entrance fee before heading in and you cannot bring plastic bottles or your own towels. Everything is there to purchase for a bit higher of a price. Also note that this is the most touristy part of Koh Tao as plenty of tourists come from Samui just to hang out here for the day. It is recommended to go as early as possible – around 9AM before the hoards of tourists start arriving. Once you arrive you should first head up straight to the viewpoint. It is a pretty easy hike up the mountain around 10-15 minutes in length. As you get to the top there are a couple larger boulders to get yourself up on in order to get to the viewpoint. Spend some time there taking some pics of the view with the islands and sandbars in the background. After enough time up top head back down to the beach itself. You can spend anywhere from 1-2 hours laying by the beach and taking a swim (try and get further away from all the tourists who will soon be boating in). You can also rent some snorkel equipment at the island shop and take some time to see some of the underwater life nearby. ​After enough time enjoying Koh Nang Yuan head back to the dock and find your longtail boat to take you back to Sairee beach. The last boat from Koh Tao to Koh Samui will be right around 3PM (through Lomprayah) so make sure you have enough time to get back to your hotel and get some lunch before heading to the port area. Hop on the ferry all the way back to Koh Samui which should take around 1.5-2 hours, and then head on off to your hotel. At night you can check out the Bophut Fisherman’s Market, head out to a Muay Thai fight and/or hit some of the bars around Chaweng Beach. The day starts early on getting picked up to your hotel before being transferred to your speedboat for the day (note that not all tours use speedboats). Your first stop about an hour away is Koh Wao, where you can swim and snorkel the crystal clear blue waters around you. There will be plenty of colorful fish to see as you make your way through the area. After some swimming and snorkeling you will make your way to a short hiking trail that takes you above the Talay Nai emerald lagoon. From here you will also be able to see most of the 42 islands that make up the marine park. Once the lagoon is complete it is time to hit the kayaks. Your boat will take you nearby, where you will hop into a kayak for around an hour and get to explore the marine park on your own. As you kayak around you are sure to pass small caves and numerous islands surrounding you. It will now be time for some lunch and your speedboat will take you to one of the main island in Ang Thong – Koh Wua Ta Lap. Here you will also be given some time to explore the island by foot or relax by the beach for a bit. There is a great hiking trail that takes you up to the top of the island, hitting viewpoints along the way. It can get quite technical closer to the top but the views are worth it! You will then head back by speedboat to Koh Samui, where you can enjoy one more night on the island before heading out the next morning. After plenty of time seeing what the islands of Thailand have to offer it is time to head to the northern part of the country to Chiang Mai. As of this writing there is only one direct flight from Koh Samui to Chiang Mai each day through Bangkok Airways at 10AM. If you get on this flight you should arrive at your hotel early afternoon and grab some food before exploring the city and some temples. In and around the city there are more than 300 temples! To make things simple though this itinerary takes you through a list of five more well known ones to visit this afternoon. Getting around Chiang Mai is super easy – it can be a combination of walking, tuk tuks, and songthaews. The later two should only cost about $1-$3 depending on where you are going in the city. You will also have to pay a small fee to enter each temple as well. First hop in a songthaew or tuk tuk to Wat Sri Suphan. This temple complex is made nearly entirely of silver and aluminum designs. From the outside to inside of the temple you will see detailed artwork throughout. Next up is Wat Suan Dok, which you should also probably take a tuk tuk to. The walk is about 40 minutes. The cool thing about this complex is its large number of white pagodas that lead up to the larger gold one. The white ones actually contain the ashes of the Chiang Mai royal family. You can then make the 20 minute walk to inside the old city to Wat Phra Singh. Here you will find a couple temples that you will be able to enter as well as another large chedi. Within these buildings you will continue to see amazing detailed architecture as well as plenty of buddhas within them. Another 10 minute walk away is Wat Chedi Luang. This one is definitely going to seem a bit different than the previous ones visited as it looks more like a damaged ancient ruin. The reason behind the damage is due to an earthquake that occurred in the year 1545. Even so a good portion of the chedi is still there to be seen. As you begin the walk north you will pass by the Three King’s Monument. Here you will find statues of the three kings who were responsible for the founding of the city. Right nearby the monument is the last temple of the day – Wat Chiang Man, the oldest temple in Chiang Mai. Not only will you find an amazing main temple here, you will also walk by a gold topped chedi with elephant statues lining the base of the structure. You can now walk or tuk tuk back to your hotel after a day of traveling and exploring the temples of Chiang Mai. If you would like at night you can make your way to the Night Market – an indoor/outdoor market that is filled with plenty of food and souvenirs. On your second day in Chiang Mai it is time to head off to an Elephant Sanctuary to feed, bathe, and interact with these amazing animals. The main difference between the two programs is that Patara is a 1 on 1 experience with an elephant for the day (~$180) while ENP is more of a group experience (~$70). Read the In Depth Guide to Patara Elephant Farm to get a better understanding of the experience. Today you can sleep in for a bit after a couple early mornings for the past couple days. Throughout the trip you will see plenty of markets and purchase all types of souvenirs and food. However, not too from the night market area are more local, authentic markets called Warorot and Ton Lam Yai (across the street from each other). Instead of seeing hundreds of tourists you will see more of a local audience roaming around, buying their food and any other goods. Warorot is a multi story open market selling everything from clothing to fruits to wooden crafts. Spend some time just exploring these two markets and getting a feel for what shopping life is for the people who live in Chiang Mai. After checking out the markets for a bit, you can grab some lunch and then just walk around the city for the next hour or two. It is always interesting exploring the streets and stores of a foreign city. Massages are also an option as they are in any city in Thailand. Make sure though that you get back to your hotel around 3PM to get ready for a cooking class. Many of the cooking classes have an afternoon/evening session which start around 4PM with pickup being just shortly before then. Head on over to TripAdvisor to get a look at the top rated cooking classes. Once you get picked up along with your fellow guests you will make your way to a local food market. Once there your cooking instructor for the evening will teach you all about the local ingredients and what is used for different dishes. You will then get to pick 4-5 different course options for what you will be making and eating during the rest of the evening. Your instructor will then purchase all the necessities before hopping back in the van to take you to the kitchen. Many places have open air kitchens and dining rooms which is also a very unique experience instead of being indoors. A sample menu will include spring rolls, soup, pad thai, curry, and mango sticky rice. Your instructor will then take you through making and eating each dish (usually you cook two dishes, eat them and then go on to the next two). Overall a great experience cooking, eating, drinking some beers and meeting new people. The evening should end around 9PM when you continue with your group out to the bars if you choose to. On your last day in Chiang Mai it is time to see the city from above before heading back to Bangkok. During the course of your stay you have probably seen the large mountain that overlooks the city. Towards the top of the mountain is a temple called Doi Suthep that has amazing views of the city below. You can grab a taxi for a fixed rate that will take you there, wait for you and then take you back down. The road to Doi Suthep is filled with twists and turns as you make your way up climbing the hill. Eventually though you will reach the base of Doi Suthep, where a long staircase awaits to the temple. Once inside you can walk around the main area and the large golden chedi. You can then make your way to the viewpoint that overlooks the city. Due to Chiang Mai weather being hit or miss, it could be a perfectly clear day out or you could literally be in a cloud with no visibility at all. But dont worry, if there really isnt any visibility be sure to ask your cab driver to stop at one of the viewpoints on the way down the twisting roads, where you are sure to get a good view at some point. Once back down back in Chiang Mai, grab some lunch and pack up before taking a mid-late afternoon flight to Bangkok. Once back in the capital city check into your hotel, grab some dinner and head out to Khao San Road for your last night out in Thailand. Sunday Night Market – a walking street night market only open on Sundays from 4PM-12AM. You will then hop into a cab and head to the airport to begin the long journey back home. Hope you enjoy Thailand and all that it offers! Head over to our Thailand itineraries and guides page to check out some more helpful posts, and feel free to comment below with any questions!